An Autogas filling station was launched for motor vehicles in the downtown Motijheel with automatic billing system. Autogas is the common name for liquefied petroleum gas (LPG) when it is used as a fuel in internal combustion engines in vehicles. State Minister for Power and Energy Nasrul Hamid formally inaugurated the operation of the new Autogas filling station at a function at an existing Meghna petrol pump near WAPDA Building in Motijheel area. 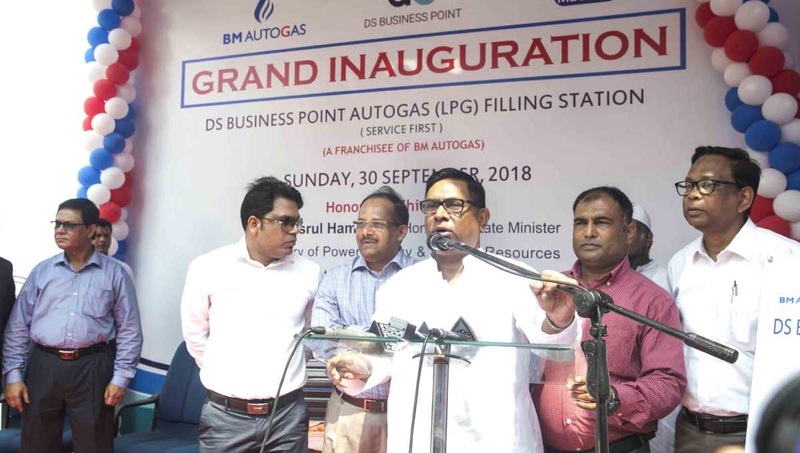 State-owned Meghna Petroleum and private BM Autogas Company jointly set up the DS Business Point Autogas filling station. Liquid Petroleum Gas (LPG) – run motor vehicles now can refill their containers with the Autogas from the filing station. With the DS Business Point, the number of Autogas stations stood at 5 in the city as four others were already in operation at Tejgaon, Mohakhali, Uttara and Saidabad area. Per litre (each unit) of Autogas will be sold at Tk 50 to the motor vehicles. But for using the LPG, motor vehicles have to be converted into LPG-enabled system. Inaugurating the Autogas station, Nasrul Hamid said the government has been promoting Autogas for its use in the motor vehicles as this is an environment-friendly fuel, which is being used by different countries across the world. He said the government is also initiated move to set up recharge stations for electric motor vehicles as developed world is now emphasising on such environment-friendly transportation sector. He said every filling station should have all such facilities like LPG, CNG refuelling and electric recharging system alongside the existing petroleum refuelling facility. The function was also addressed by managing director Meghna Petroleum Limited Mir Saifullah Al Khaled, director Ishtiak Ahmed Shimul and chief of explosive department Shamsul Alam.